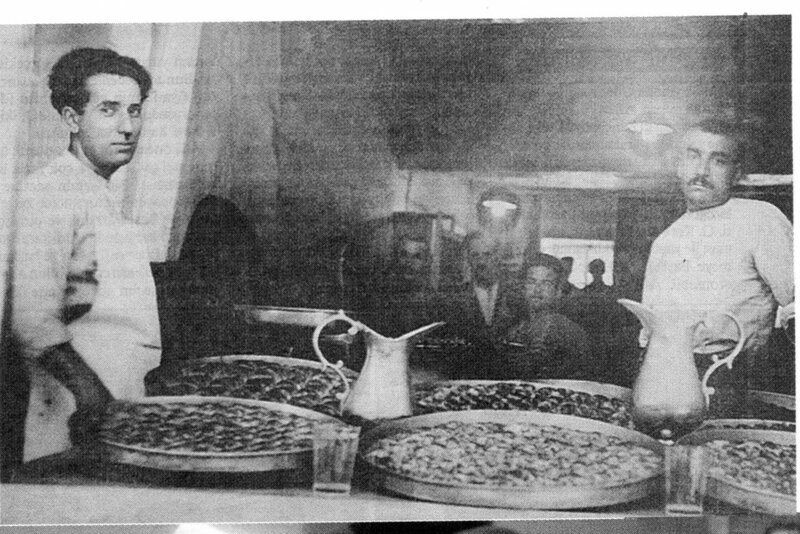 History: A master of baklava from the Güllüoğlu family in Gaziantep, Mustafa Güllü, first introduced the people of Istanbul to the oriental delight on November 7th,1949. He opened the first baklava shop in Istanbul on Halilpaşa Street No: 12 in Karaköy. 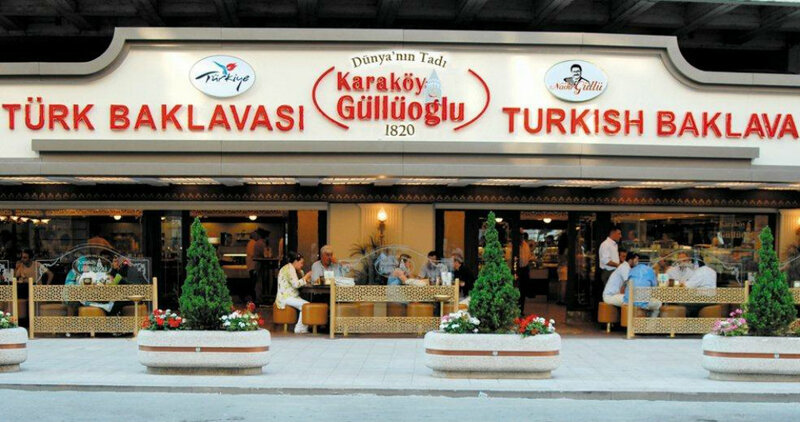 Since that day the first address for baklava in Istanbul has been the Güllüoğlu shop in Karaköy. The family has been in the baklava business since the 1800s. 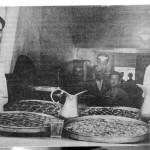 Hacı Mehmed Güllü was the first in the family to start to production of baklava in Gaziantep. Mehmet Çelebi was nicknamed ‘Güllü Çelebi’ meaning ‘Çelebi with a rose’ due due a rose shaped scar on his face. The nickname stuck and became a family name. Making and selling desserts has always been important in Gaziantep. When Güllü Çelebi entered this business, he went to Damascus and Aleppo, which were very famous for desserts, to learn more about the details of making baklava. He stayed there for 6 months and learned as much as he could about this delectable pastry. When he returned to Gaziantep he set up his own sweet stall. After his death, his son Hacı Mahmud Güllü continued his father’s business and started making baklava with a thin sheet of dough made by a roller. When Hacı Mahmud Güllü’s four sons continued their father’s business, the making of baklava had become the family tradition. In the 1930’s, the Güllü family started to send their baklava to other nearby cities. This made the family known in a large area. The grandson of Hacı Mahmud Güllü , Mustafa Güllü , thus decided to carry the business to Istanbul. That first shop in Karaköy in 1949 was also the first baklava shop outside Gaziantep. In the following years the business became widespread and now there are now many shops all over the city. Some of these shops belong to the members of Güllü family and some to the experts who grew up in the shop. When Mustafa Güllü tells about the first days of the shop he always mentions how hard it was those days to find customers. Most of people in Istanbul didn’t know baklava those days. The ones who knew and tasted it, had tried baklava which were not fresh and so they didn’t care to repeat the experience. Mustafa Güllü had a challenge before him: to change the concept of baklava. ‘For a few years we offered free baklava. To offer free baklava we handed out leaflets in the street. A kilo of baklava was 5 TL. We took orders by phone from Taksim, Nişantaşı and Şişli and we sent the orders without charging extra for delivery. Mustafa Usta advertised baklava by showing a commercial in the Atlas Theater as well as advertising in newspapers and magazines. He even had advertisements placed on the walls of subway and trams. But, he says, that their real advertisement were the people who tasted their baklava. Mustafa Usta’s efforts began to pay off after 1953. The shop moved to Havyar Han No: 23. In the 1970s the shop on the ground floor of the multi-story car park in Karaköy was set up. In 1990 the company was incorporated and adopted the trade name “Güllüoğlu Food Industries and Trade Inc.” It is still known as “Karaköy Güllüoğlu” and is distinct from other firms known as “Güllüoğlu”. Karaköy Güllüoğlu, which started as a small shop in Karaköy in 1949, now is the owner of the first baklava factory in the world. The company is able to produce more than 2.5 tons of baklava. Still in Karaköy on Mumhane Street no: 171, Karaköy Güllüoğlu has only two shops. One in the basement of the factory and the other in the ground floor of the car park in Karaköy. People who are fans of baklava come to Karaköy from all over Istanbul. Karaköy Güllüoğlu has regular clientele who will never tire of the flavour and freshness of our baklava. There are people who have been buying their baklava from Karaköy Güllüoğlu for over 50 years. When these regular customers come, they meet with the faces they have known for 50 years. At the counter Muhsin Bey and Hasan Bey, true Istanbul gentlemen in our words, welcome their customers. At the cash register, you’ll see Mustafa Güllü – the pillar of the company. Although the master Mustafa Usta, has grown old, he still comes to the shop regularly. He is always at the cash register until late afternoon. But he is not only in charge of payment; he is also the one who chooses the butter, flour and nuts himself. In short, he is the supervisor of the whole operation. Four of the five sons of Hacı Mustafa are in their father’s business. The oldest son, Nejat Güllü founded his own shop in 1983 in Kadiköy. Another son Faruk Güllü left the Karaköy factory and started his own in Bakırköy in 1993. Nadir and Ömer Güllü have stayed with their father in Karaköy. Nadir Güllü dreamed to have a factory sized production center for baklava. When he became the head of the business he set out to realize his dream. It was he who founded the factory on Mumhane Street in 1966. Karaköy, the center of banking and commerce in Istanbul, has also become the center of baklava since 1949. Karaköy Güllüoğlu is a different flavor and color in this bustling business center. It is also a part of the surrounding neighborhood. Famous for: Classic baklavas, special baklavas, special products (desserts which cater to certain health conditions), other desserts, pastries, candies and dried fruits and nuts.